Valentine’s Day is getting ever closer: have you already thought of a present for your partner? It’s the perfect moment to thank the boyfriend who supports you in all your decisions, the husband who is always at your side when you are faced with life’s little challenges. The day that celebrates lovers is an opportunity to spend time together: a romantic meal, a stroll hand-in-hand, a moment of relaxation to share. To complete the day, a special surprise: a gift that will make him understand how important he is to you. A gift that will endure over time, that is capable of telling your love story. For Valentine’s Day 2019, choose a piece of jewellery for him: the importance of an accessory rich in meaning, with the guaranteed quality of the Made in Italy brand and the company Nomination. This Valentine’s Day, do you want to surprise your boyfriend or husband with a gift that is as unique and original as he is? Are you looking for an accessory that can symbolise your love story, that will carry your memories over time and that he can wear every day, to feel close to you at all times? We have chosen the most romantic men’s jewellery for you, perfect for a special Valentine’s Day gift. There are plenty of accessories to choose from for your man, made only with materials of high quality, such as gold, silver, steel, leather and stone, to commemorate a love story with many pages yet to be written. Valentine’s Day is a moment to celebrate the love of all couples, from those which are new to those which have endured over time. The first Valentine’s Day together will never be forgotten, and because of this your boy deserves a gift that is special, just like your love. For your loved one, we have a selection of romantic jewellery that can be worn for any occasion: accessories that give character to a casual outfit for everyday wear, but also elegant jewellery to wear on special events and formal evenings. To each his own piece of unique and original jewellery: discover all the men’s accessories to give to your partner on Valentine’s Day 2019, starting at low prices! Choosing a Valentine’s Day present for your boyfriend or husband is not always easy: we want to amaze him every year with something special, unique and surprising. What is the perfect gift for celebrating the day of lovers? Our suggestion is an accessory that a modern and stylish man couldn’t refuse: the bracelet. 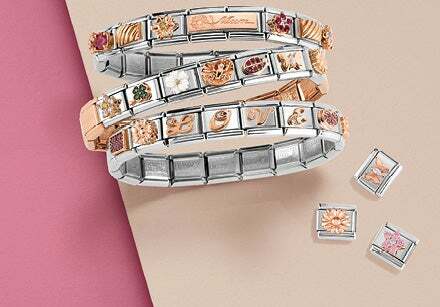 There are many types, and you can choose depending on the style and character of your loved one: from leather bracelets with steel detailing, to those decorated with symbols and engravings in gold and silver to send a special message to your partner. For Valentine’s Day 2019, are you looking for a truly unique piece of jewellery? Create a Composable bracelet just for him: choose the base and personalise it with the precious fabrics that best represent your love.